The motor in your miniSpinner should not get warm in normal use. If it does, the heat sink will be warm. If the heat sink does get warm, it means something is wrong with your miniSpinner or your technique. The motor should not strain when you're spinning; it should go about the same speed as it would at no load. If it is straining and running much slower than it normally would at the speed setting you're using, it will be working too hard. WooLee Winder flyer that needs to be cleaned and oiled. Improper technique - reduce the brake tension to the point where your thread/yarn will not draw in, then increase it only to the point where it will wind on to the bobbin. This is the perfect setting for brake tension. Plying with high speed and high brake tension to make it go faster. Reduce the brake tension and speed slightly. Plying by forcing your miniSpinner to pull your threads from the lazy kate. You should feed the fiber into your miniSpinner, not force it to pull it in. Fiber wrapped around the shaft of the motor between the motor body and the sheave (pulley). This is more likely to occur in early miniSpinners; we enlarged this space in later models to prevent this from occurring. Even in earlier miniSpinners, it hasn't been very common unless the machine is very dirty (see below). Use the pick from your Maintenance Kit to remove the fiber. 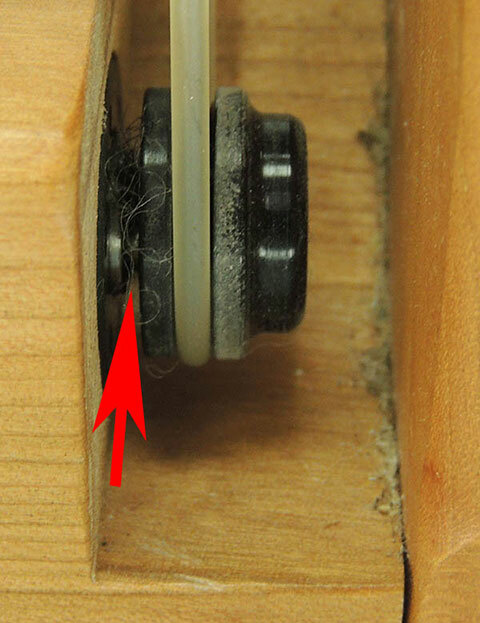 It is important to keep fiber out of this area as it will ruin the motor if it gets into the motor's ball bearing.